Hugs and kisses to Kit of Ava’s Cake and Party Shop for sharing this lovely party with me! For the past couple of years, more and more would-be parents are hosting “Gender Reveal Parties” over the traditional baby showers. But here in the Philippines, only a handful joined the bandwagon. Basically, instead of announcing the excitement of “We’re having a baby Boy/Girl!” over a phone conversation, the expectant couple, together with their close family and friends all gather to “guess” the gender of the baby and celebrate that “surprise” moment. At the end of the party, the big REVEAL takes place – some by opening a box with blue or pink balloons inside or by cutting a cake with blue or pink fillings inside. It really becomes a special moment not just for the expectant couple but for everyone in the party! They limit the color to white, pinks and purples, blues and greens, hence the bright and homey feel of the venue. I just love how they cleverly incorporated some baby items in their party decors! Their table setting comes with a little treat for their guests as well – Meringue overload! Let’s take a closer look at their baby’s nook. Write a message for Mommy Tin and Baby Apostol. Hints based on Mommy Tin’s cravings and predictions based on some old wive’s tale! How about you, what’s your guess? What’s a gender reveal party without some fun and exciting guessing game? They had: guess the gender of the baby (wherein they also have to wear their guess – bow or bowtie), guess the number of safety pins and a memory game by listing down as much baby items they’ve seen in the suitcase. I must say, their dessert spread is very much into the theme too. I love how they used the baby bottles complete with cloth diapers instead of the usual mason jars and milk bottles. The chevron cake, yum! Oh…and the blue and pink lemonade, too! herSHEy’s and hersHEy’s chocolate bars – get it? Wondering what’s the big reveal? They had a box of balloons where only the stylist, Kit and the sister-in-law, Jojami knew what the color was inside. They made kutsaba with the radiologist that’s why Mommy Tin didn’t have any idea at all! The expectant couple only knew about it during the reveal part, together with the rest of their guests. So imagine the suspense and emotions during the big reveal. 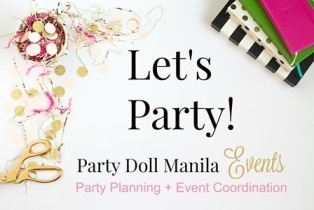 I would like to commend the party planners – Jojami and Ariane, together with Kit and Ace for this great party! Super fun party indeed 🙂 and just a little correction there, it’s mommy Tin and Daddy *Kevin* 🙂 Ecstatic to see this party featured. Cheers, Ava’s & Jo! Hi ariane! Great party! Would love to see mommy tin’s reaction during the reveal, for sure it’s priceless. such a fun set up of the place! i love how colourful and bubbly the whole place is! kaya pala the set up is familiar 🙂 it’s from Ava’s pala! wow great decors..the stylists are truly talented! great job! I can just imagine the suspense. Great party. I love the pink and blue combination.